Pat McGibbon is calling on his past experiences to help the next generation prepare for future challenges. 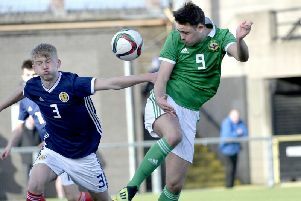 The former Northern Ireland international can reflect on a playing career that featured Milk Cup campaigns before a decade-long run across the water in professional football. Lessons from his time on the books at clubs such as Manchester United and Wigan Athletic hand McGibbon a special insight into making the most of natural talent to grab every opportunity. McGibbon has spent the past few seasons as coach of County Armagh’s Junior panel and embraces the challenge of developing players in a number of areas. “We managed to get in plenty of games to help the squad blend together for what is such an intensive week,” said McGibbon. “We started a bit earlier this year with that in mind. “I work more with the mental aspect and try to get into the heads of the players, especially when many of the group may be away from home for the first time. “A good start can be crucial for building confidence and we want to establish the right base but also a chance to be creative. “It is a wonderful platform, with our responsibility to send out as strong a County Armagh squad as possible but also allow the individual to showcase his talent. The junior players face sides from England and Ghana alongside domestic opposition across the group stages. McGibbon’s coaching team includes Glenavon player Kris Lindsay and Nathan McConville, the latter with experience of the Cardiff City Academy. Tyler Boyce (Lurgan Town), Sean Toman (Dungannon Swifts), Declan O’Neill (Lurgan Town), Daniel McKeown (Windmill Stars), Cathal McGinty (Glenavon), Ben Davison (Lurgan Town), Sam Murphy (Dungannon Swifts), Barney McKeown (Portadown), Oisin Smyth (Dungannon Swifts), Luke Wilson (Ridgeway Rovers), Robbie McAteer (Glenavon), John Lee McAfee (Glenavon), Josh Megoran (Portadown), Mark Lucas (Loughgall), Tom Weir (Cliftonville), Alberto Balde (Portadown), Darragh Gray (Lurgan Town), Adam McAlpine (Glenavon). Matthew Leyburn (Dungannon Swifts), Mark Johnston (Portadown), Brendan Litter (Portadown), Ross Wilson (Loughgall), Connor Murtagh (Dungannon Swifts), Shea Geraghty (Armagh City), Scott Megaw (Portadown), Eoin Toal (Armagh City), Caolan Marron (Warrenpoint Town), Reese McInerney (Armagh City), Tiarnan Judge (Lurgan Town), Patrick McPartland (Portadown), Andrew Wilson (Linfield), Nedas Maciulaitis (Portadown), Ryan Lewsley (Glenavon), Adam Metcalfe (Portadown), Kevin McAliden (Lurgan Celtic), Conor Larkin (Armagh City).